MAI KHAO, PHUKET: Phuket’s decades-old dream of having an international-class convention and exhibition center took another turn yesterday, when Deputy Prime Minister Korbsak Sabhavasu toured the proposed project site in Mai Khao and suggested a number of changes to the latest plan. Mr Korbsak, Deputy Prime Minister in charge of economic affairs, reaffirmed that Cabinet has approved 2.6 billion baht in funding for the project. However, the existing design may have to be changed depending of the results of the Environment Impact Assessment (EIA) process, he said. Mr Korbsak, a Democrat Party member, said he was unhappy with certain elements of the project design as presented by Pitak Direksuntorn, director of the Treasury Department’s State Property Management and Services Office, or Ratchapassadu. 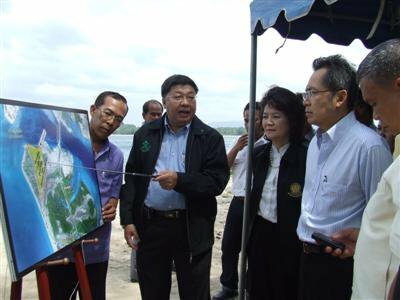 Under the latest design, the project would be built on 150-rai of Treasury Department land at the island’s northern tip near Tah Chat Chai village. The Treasury Department initially requested 3.74 billion baht for the project, Mr Pitak said. When Cabinet approved just 2.6 billion baht the project needed to be scaled back, so one of four exhibition halls and a hotel were axed from the initial design, Mr Pitak explained. “When we get the rest of expected budget, the fourth exhibition hall and hotel will be built,” he said. Part of the 210-day EIA process involves a series of public hearings. When that is completed, the two-year construction period could begin, he said. Under this time frame, if the EIA begins at the start of 2010, the project would be completed around July 2012. Under the current plan, the construction would be carried out by King Mongkut’s Institute of Technology, Ladkrabang campus. After completion, contracts to administer the facilities would be awarded to private firms on a concessionary basis, Mr Pitak said. Mr Korbsak questioned the reasoning behind putting a university in charge of construction. He suggested using one of the five private-sector construction firms who tendered bids for construction of the new Parliament building in the capital instead. “I think that would be more professional,” he said. Mr Korbsak also expressed concern about the environmental impact of the project. He questioned the need for an underground car park and a hotel at the site and said he felt saddened that the natural beauty of the area would diminished. He also asked that damage to existing vegetation be minimized. “The project design should better match the existing landscape, perhaps with a small park or promenade for people to stroll on,” he said. As for water supply, a source familiar with the project said the current plan is to pipe water from the Bang Neaw Dum in Srisoonthorn district, about 25 kilometers to the south. After the visit Mr Korbsak traveled to Phuket Provincial Hall, where held meetings with representatives from a number of government organizations about the government’s controversial Thai Khem Kaeng (Strong Thailand) scheme that he oversees. Asked whether the Mai Khao site would definitely be the location, Mr Korbsak said he was ‘1,000 percent’ certain it would. The Mai Khao site has many detractors, who say it is too distant from the main population centers and could end up like the underused ‘Welcome Gate’ visitors’ center nearby. Phuket Thailand Open: World’s largest women’s beach volleyball event!